What Do Teachers Do During Free Choice? Facebook… sometimes Pinterest if the students are playing well. Connect with my students. If my students do not feel connected to me, to the class, or the school environment they won’t feel comfortable to explore. I connect to them by playing with them. Following their lead and addressing questions as they come up. Some days that might mean talking in depth about Elsa and Anna, about something going on at home, or their imaginary friends. All of this matters. No matter how silly it might be, follow along and get connected. Everything is easier with a connected class and that only happens if you take time to know each child. Work on specific learning goals. I work with students on developing literacy and math concepts , language… whatever skill it is that I have noticed they are in the midst of developing. Having a great co-teacher makes this much easier. Talk about what you have both noticed the children developing ” Did you see Suzie can count to 25?! And Billy is talking so much more?” When you share that info you can act on it. Now you can work on counting to 30 with Suzie while you play with pom poms in the sensory table, and keep engaging Billy in coversation. This is not high pressure learning. It takes time to get to know your students because this shouldn’t be quizzing, just scaffolding. Work on supporting friendships and modeling social skills. 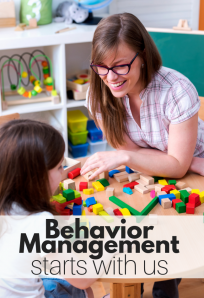 The same way that you take note of your students learning you can also take time to observe their social development and work on specific goals for each child instead of only addressing social skills focused on the whole class. Play because through play I can do the other three much better than through direct instruction. So yes I do get to play when I go to work, no wonder I love it! Sitting with children playing play dough you might mention how the play dough feels on your hands, you might tell them that you are making pizza dough and ask them if they like pizza, you could make lots of small balls and squish each one while counting. 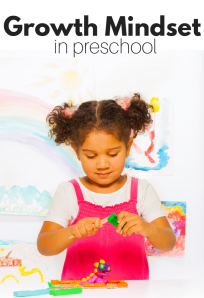 You don’t need to tell the child what to do just model all different ways to use the material and offer opportunities to connect by learning more about each other.You don’t need to tell the child what to do just model all different ways to use the material and offer opportunities to connect by learning more about each other. At the sensory table you can fill up cups wondering out loud if you can fit two full cups of the filler into the bigger jar. You can say that you want all the yellow pom poms on this side and the red ones on the other and then wonder out loud how many there are. You can dig in with your hands and talk about the texture of whatever is in the table. More than anything you can mirror what the students are doing and just listen. At the kitchen area you can sit down at the play table and ask a child what they are cooking you or ask them what they feel like having for dinner. If you notice the book nook being neglected sit down and start reading silently. I am not sure I have ever done this and not had a child land in my lap and ask me to start the book again. These are just some examples that have popped into my head. The reality is that you don’t have to say anything 99% of the time. Start playing next to your students and the learning opportunities will flow. As a new teacher, I always wanted to quiz and tell ” What color is that play dough you are using Johnny?” ” Yes it’s red.” or ” No, it’s red!” this isn’t an effective way to engage young kids. Let them explore and as you get to know them you will be able to work in some targeted learning goals naturally. Forcing it turns an engaging classroom into a quiz show and that’s not very inviting. My overall goal as a preschool teacher is to make school a safe and happy place to be. My classroom is one of my students’ first experiences with school and I want to make a lasting impression that learning is fun. Now I ask all of you teachers and homeschooling parents – What do YOU do during free choice? 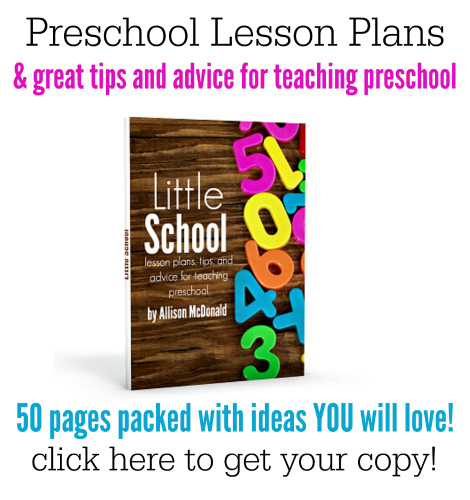 Get more tips, advice and 15 detailed lesson plans in my new book! 1. I’m validating what good parents do. There’s *a lot* of pressure on parents today–the younger parents, especially, feel that. Often, they’re instinctively doing the right thing, but don’t realize that-like the mother of the little girl who told me how the Easter Bunny had come to her house & given her play dough! Mom smiled and said to me, “She loves play dough. She has so much fun with it.” When I responded, “Yes, and it’s so good for them,” Mom was genuinely surprised–thrilled to hear that she was doing something that would help her two year old with writing when she’s older, but also sort of shocked that her parenting instinct (child having a good time with a safe activity, so it’s probably a good activity to encourage) was right. 2. I’m validating a play based approach to the parents & caregivers. Because it all makes sense to them when they simultaneously see their child engaged & learning while having a professional narrate what’s going on. They’re often amazed when they realize “she’s learning so much, but she thinks math is just games,” but they do “get it.” I like to think this helps early childhood teachers everywhere. 3. There’s *a lot* of jargon in education, at least in the US. And that scares parents. I translate & they calm down. Even the parents who are educated, native speakers don’t necessarily know what terms like “text to self” and “text to text” and “rote counting” mean. 4. I’m serving as a resource of ideas & activities for the adults. I find they usually want to replicate activities at home. I answer questions on where materials can be found, how to make play dough, that sort of thing. 6. I’m modeling success: I’m the librarian born with a birth defect, who has multiple disabilities, who was told as a teenager that my problem was that I was aiming too high & if I would just accept that I was not going to be able to finish college or hold a job, I’d be much happier. Here I am, with a masters degree & my dream job. There are kids who light up when I tell them that–but their parents really desperately need to hear that too. You are so valuable I’ve started volunteering in our British children and family centre doing similar, after gaining my degree. Well done for getting so far. Observe, observe, observe! Wait and watch, take in a moment to see what the children are seeing. What needs are being met by the materials available. What needs are not being met by the materials available, and what is lacking in the environment. Bear witness to all the learning that happens organically when we step aside and let the child do his/her work! I teach 2 year olds. 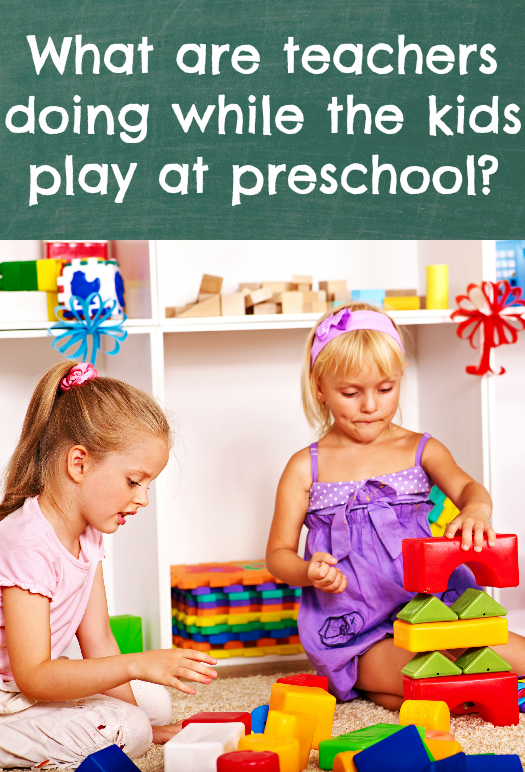 During free play time I do a lot of the things mentioned in this post, but I also sit back and observe. I watch how the children interact with each other. I listen for impending arguments over toys. Sometimes I have something that I want to share with the kids that I don’t have time for during my teaching time. It never fails, I will bring something out quietly and sit at a table and they always come over to investigate. I have to work with their short attention span so that they are interested in what I say. 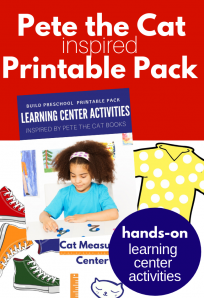 I was a preschool teacher and we mainly did hands on with kids. It was great to see the build up their own ideas and then work on it. Like one boy brought blocks. They made a whole city and then suddenly one of them made the letter f. And they all started on making a city of letters. God bless you, everyone! You are incredibly important to the lives of the children and families. Yours is the most important profession in the world. Thanks for sharing this. Your article have been a great encouragement to me. I’ve been working with children and spending most of my time talking to them than to my co-workers when we have free play. I’ve always enjoyed watching and observing the children during free play and reading is one of my favorite. Every time a child discover or utter a new word, I felt as though I am like a kid at the candy store. I am so happy to hear you love teaching so much, I am endlessly fascinated by their little growing minds and personalities too! I am thankful for the reminder while I was reading it dawn on me that for years I was doing a lot of things wrong thanks again the reminder really help me to refocus on making the students day fun.